Sharlene wrote and asked: "Hi there! Received a Jerusalem Cherry - know it is poisonous - no animals or little ones near by. I would like to know the care it takes? Light - water- indoor/out temps. Thanks a million." The Jerusalem Cherry belongs to a diverse family of plants that includes Nightshade, Cockroach Berries, Horsenettles, Tomatoes, Potatoes and Egg Plants. 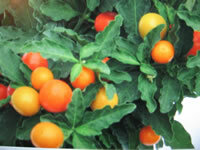 Jerusalem Cherry Plants are most commonly grown as a potted house plants. When grown as a house plant, Jerusalem Cherries require full sun to thrive, but they will survive in moderatly bright light. Jerusalem Cherry plants are prone to drop their foliage and/or flowers if they are grown in a warm (above 72°), dry environment so it is a very good idea to mist your Christmas Cherry often. Jerusalem Cherries should be planted in a rich, well drained potting soil, and kept moist during their active growing cycle. Feed with a liquid 5-10-5 'blooming houseplant' fertilizer every two weeks while the plant is growing vigorously. Discontinue feeding as soon as your plant has finished blooming. After all the 'cherries' have dropped, cut your plant back drastically, and next spring, after all danger of frost has passed, plant it outside in a partly sunny part of your garden. If you are lucky enough to live in a frost free zone, your Jerusalem Cherry will develop into a nice 2-3 foot, woody shrub. repot it, and begin the cycle all over again.